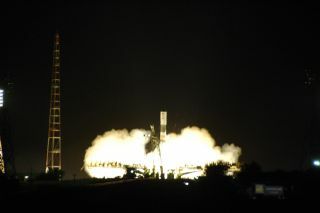 Russia's Progress 30 cargo ship launches toward the International Space Station atop a Soyuz rocket on Sept. 10, 2008 at the Baikonur Cosmodrome, Kazakhstan. An unmannedRussian cargo ship docked safe and sound, though a few days late, at theInternational Space Station on Wednesday after a hurricane on Earth preventedits orbital arrival last week. The Russianspace freighter Progress 30 arrived at a docking port on the aft end of thestation?s Zvezda service module at 2:43 p.m. EDT (1843 GMT) today in a raredays-late delivery. The automated cargo ship was initially scheduled to arrivelast Friday, but was delayed when Hurricane Ike forced NASA to evacuate itsMission Control center in Houston before the storm hit last week. ?We knowthat everything went well and they docked on time today,? said Mike Curie, aNASA spokesperson at the agency?s headquarters in Washington, D.C.
Progress 30launchedSept. 10 to haul more than 2.5 tons of fresh supplies to the space station?sthree-man crew, including about 2,866 pounds (1,300 kg) of fresh food,clothing, equipment and other dry cargo. The space tug also carried about 1,918pounds of propellant for the space station?s thrusters, 110 pounds (50 kg) ofoxygen and 463 pounds (210 kg) of water. Russia?s InterfaxNews Agency reported that the cargo ship also carried a new Russian-builtOrlan spacesuit. Aboard theorbiting lab, Expedition 18 commander Sergei Volkov, flight engineer OlegKononenko — both Russian cosmonauts — and NASA flight engineer GregoryChamitoff were expected to open hatches between the space station and Progress30 later today, Interfax reported. WhileRussian flight controllers watched over Progress 30?s automated arrival fromtheir Mission Control center outside Moscow, NASA mission managers were doingthe same at a backup center at the Marshall Space Flight Center in Huntsville,Ala., Curie said. NASA closeddown its primary space station hub at the Johnson Space Center in Houston onSept. 11 to allow personnel to evacuate ahead of Hurricane Ike. The evacuation camebefore NASA flight controllers had turned the space station?s U.S.-built solararrays edge on to the incoming cargo ship to prevent them from being damaged bythe spacecraft?s thruster firings. Backup stationcontrol centers were set up at a hotel near Austin, Texas, and the Marshall SpaceFlight Center. The Johnson Space Center suffered minor damage, includingroof damage to the building housing Mission Control, during the hurricane,NASA officials have said. Curie told SPACE.comthat NASA space station operations are currently being coordinated out of theMarshall Space Flight Center, with the primary Mission Control Center inHouston on track to be reactivated on Friday. The Johnson Space Center in itsentirety is expected to reopen on Monday, he added.